I missed the 3rd instalment of this huge franchise, and to tell you the truth, it didn’t make much difference (and I doubt if I’ll make any conscious efforts to fill the gap). 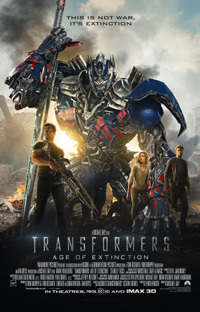 With the character of Shia LaBeouf written out, Bay’s Pain & Gain star Mark Wahlberg takes the spot of the human trapped between Autobots and Decepticons, battling it out on earth. The destruction left by the 3rd movie has the government deem all Transformers to be a dangerous threat, whichever side of the fence they’re on. So, they are tracked down and destroyed with the aide of a powerful robotic bounty hunter. A defence contractor is also utilising new transformer- and nano technology, naturally heading for disaster. Here the location ends up in Japan with some of the most ridiculously huge CGI action sequences that can easily become a blur instead of awe-inspiring. Early on I couldn’t help but notice how almost every scene features an American flag, sparking the thought that this could make for quite an inebriated drinking game, if you’re inclined to look for creative excuses to get trashed(!). With a whole lot of visual and audio noise, exciting and stupid scenes, the viewer is dragged through another almost quarter billion dollar spectacle that could leave you feeling digitally pummelled at the end of it, whether you wanted to or not. Naturally, this is no art film, but a technically accomplished, high-energy spectacle for kids (and young at heart), nothing more, nothing less.